The Fairfield Lions track and field team gathers in front of the concession stand located at the Fairfield Track and Field complex in Leesburg. The Fairfield Lady Lions track and field team gathers in front of the concession stand located at the Fairfield Track and Field complex in Leesburg. The Fairfield Lions boys and girls varsity Track and Field teams finished first and third respectively at the 2018 Southern Hills Athletic Conference Track and Field Championships with each team relying on the talent of the distance runners on their respective teams. 2019 will be no different for the Lions and Lady Lions as they aim to be elite distance runners in the SHAC and the Southeast District. The boys team will showcase eight returning athletes including Senior Brandtson Duffie who finished third in the boys 800-meter run at the OHSAA State Track and Field Championships in Division III and the anchor of the boys 4×800-meter team that finished 13th at State. The other returning member of the 2018 State qualifying boys 4×800-meter relay team that is returning to the program is Senior Bennett Hodson. 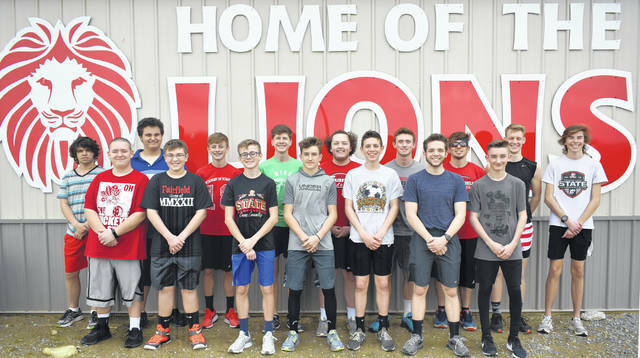 Cohen Frost, Ethan Davis, Devin Campbell, Wyatt Fent, Ethan Saunders and Ethan Whalen were all key members of the 2018 edition of the Lions Track and Field team and all of them will be expected to perform well this season. Marsh is also expecting the younger athletes on the roster to contribute to the winning culture that Fairfield has cultivated and mentioned two in particular. The goals for the Lions this season are the same as they have been, win on all levels. The Lady Lions also have high expectations this season with experienced runners up and down the roster including Senior Ciara Colwell and Sophomore Morgan Richmond. The Lady Lions were third in the SHAC meet at year ago and will be looking to improve on that standing this season with a core group of returning athletes looking to make their mark on the program. The Fairfield teams will start the season with away meets at Zane Trace and Nelsonville-York on March 28 and 30 before returning home on April 2, to host their home invitational. The Lions and Lady Lions will wrap up their regular season schedules at Yellow Springs on Friday, May 3 and will host the SHAC Track and Field Championships at their home facility on Friday, May 10.